There is nothing more delicious, comforting, appetizing and filling than a bowl of well-prepared noodles, whether one is dining in the East or the West. Noodles are a favorite food among people of all ages, and nearly every culture where grain is consumed has created some sort of noodle to beguile the senses and fill the stomach. Few countries can claim as many different sorts of noodles as China, arguably the birthplace of the noodle as a foodstuff. Over a period of many centuries, noodles have been developed and refined in China, until they exist in a culinary class all by themselves. They are eaten all over the myriad regions of China, and they are eaten in many different forms and types of preparations: from cold appetizers to soups to savory stews, noodles are a mainstay of the Chinese diet. There is no way to adequately enumerate the plethora of noodle types, preparation and recipes in a single essay or article, so small post is just meant to whet the appetite for more writings to follow. But, a concise summary is possible, and so we begin. A visit to a well-stocked Asian grocery store will reveal a dizzying array of noodles. They are usually grouped in their own aisle or aisles, but there are also offerings of frozen noodles and fresh, chilled noodles in the refrigerated section. To the beginning shopper, the broad selection is challenging, and can cause frustration if one doesn’t know exactly what one ones and needs for a given recipe or cooking style. To simplify the issue of Chinese noodles, it is best to remember that they fall into three broad categories: those made of wheat, those made of rice and those made from other, often vegetable, not grain-based, starches. Within each of these three categories are myriad different types, shapes and sizes of noodles, each one useful for different recipes. Wheat noodles are the most prevalent staple food, along with buns, steamed breads and fried cakes, in the colder, northern regions of China. The climate is more conducive to the growing of wheat than rice, and so cooks of these regions have developed a great number of delicious ways to use the many different types of wheat noodles available. The love of wheat noodles is not relegated purely to the northern parts of China, of course; they are now eaten all over China. Generally speaking, wheat noodles are made in two ways: with and without eggs. Both types are available either fresh (or frozen) and dried, and they are also available with or without additional flavorings and colorings such as shrimp roe and spinach. Some noodles are salted, and others are not; the easiest way to determine whether a noodle has salt or eggs in it is to look at the ingredients. They are always noted in English on the back, and that way, if you want egg noodles, you can be assured of getting them, instead of relying only on the yellow appearance of the noodle, which can be accomplished with food coloring agents. The second broad class of Chinese noodles are the ones made of rice flour. These noodles, which originated in the rice growing regions of southern China, are always made simply of rice flour and water, and like wheat noodles, they are available both fresh (or refrigerated or frozen) and dried. The fresh ones are pure, pearly white, and glisten with a light coating of oil to keep them from sticking to each other, while the dried ones come in translucent bundles which look like cellophane or plastic. Rice noodles, like wheat noodles, can be used for many different dishes, but, because they are made from rice, which lacks the cohesive springiness of gluten, they are treated differently than their wheat-based cousins. Their texture, which is different from wheat noodles because of the lack of gluten, can be by turns tender or chewy, smooth or crisp, slippery or sticky. Their flavor is mild and takes on the flavor of whatever they are cooked with. 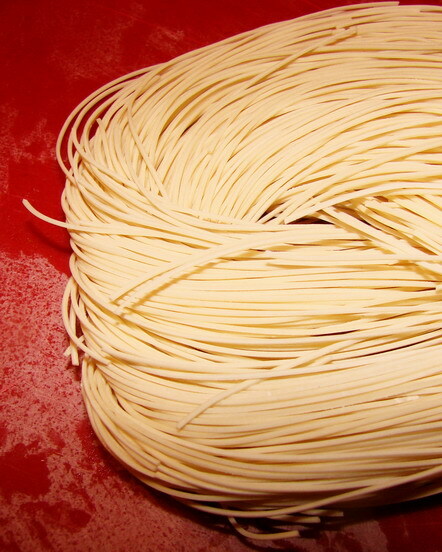 The third category of Chinese noodles are the ones which are made from starches other than those derived from grains. This group includes bean-thread noodles, which are also known as glass noodles or cellophane noodles. These are made from mung bean starch, and they are usually very thin, hair-like noodles sold in dried bundles. Soaked before use in soups or stir fried dishes, bean thread noodles turn from brittle, nearly transparent threads into slippery clear noodles which have a unique texture and no flavor to speak of. They are prized for their texture, their translucency, and their incomparable ability to soak in the flavors of the surrounding dish. Other starches are used to make Chinese noodles, including those derived from sweet potatoes and tapioca. The skin that forms on the top of heated soy milk, called yuba, is also used to make very chewy noodles, and highly compressed tofu is cut into thin strips to be used in cold noodle dishes. As if the great variety of noodles alone was not confusing enough to the novice, the Chinese have developed many different cooking methods to bring out the best in these versatile foodstuffs. Texture plays as much of a role in Chinese cookery as flavor does and over the centuries the resourceful cooks of China have come up with a variety of ways to cook their noodles, often using one or two different methods in concert to create a very specific and particular texture which is prized in various noodle dishes. Even the simple act of boiling wheat noodles is done differently in China than we are used to using to boil pasta in the West. Because the wheat used to make Chinese noodles is a different variety than those used in Italian style pasta, it is easy to overcook the noodles into a starchy, tasteless mush. So, the Chinese do not just dump their noodles into boiling water and time them until they are done. The temperature is controlled precisely by stopping the boil several times during the cooking process, leading to a noodle which has a greater elasticity and is not overcooked. Other techniques which are used to create excellently flavored and textured noodles include steaming, deep frying, oil blanching, and stir frying. Most Chinese cookbooks for the American cook do not enumerate these techniques; I have been lucky enough to learn them directly from Chinese restaurant chefs, home cooks and from out-of-print cookbooks, and over the next few months, I will pass them along here in my blog. None of them are difficult or onerous and the results are fantastic, and are well worth thee small effort that is involved. The next posts in this series will be all about Chinese wheat noodles-what types there are, what they are used for, how to cook them, and recipes featuring them. Then, I will cover rice noodles, and other noodles made from various starches, with recipes and cooking methods. Finally, somewhere along the way, I will do some book reviews on tomes relevant to the cooking of all kinds of Chinese noodles. kat the supermodel!! she is just the best. Kat has such a face of delight. Getting your hands into noodles, slurping up a long one…makes dinner a fun sensory experience. I am giggling right along with her. Awesome! Noodles are dear to my heart and I’ve always wanted to know more about asian noodles. Thanks for sharing your knowledge on this. YAY!!! I am always experimenting with Asian noodles but am so happy to learn more. I adore noodles of all kinds, from the East and the West. I have always noted that you can find noodles in most cultures, and dumplings in every culture. OMG, Kat, you are just too cute!!! Thanks so much, Barbara… I experiment with Chinese needles all of the time. I’m going to print this and keep it in my pantry as a reference. Glad to see a recovered and exceptionally cute Kat! I’m eagerly looking forward to learning more about noodles so I can better exploit the vast array in the Nat Food Store nearby. That is the best way to eat noodles- stuff handfuls of them in your mouth 🙂 Kat is sooo cute! 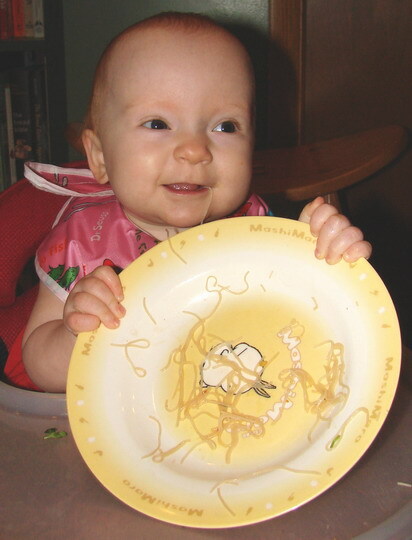 Thank you so much for this wonderful post, Barbara, and I can’t wait to learn more about noodles. You are so generous…sharing what you know with people who don’t have access to the experts. I missed most of the noodle comsumption, as I was downstairs tuning drums, but came up in time to see the first picture Barbara posted be taken. I might have mentioned this before, but I love being a part of watching this little kid grow up. Kat is so adorable! 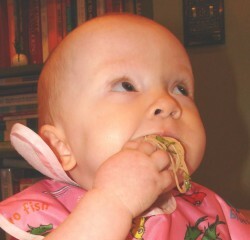 She looks like she’ll be a great (and non-picky) eater when she grows up! 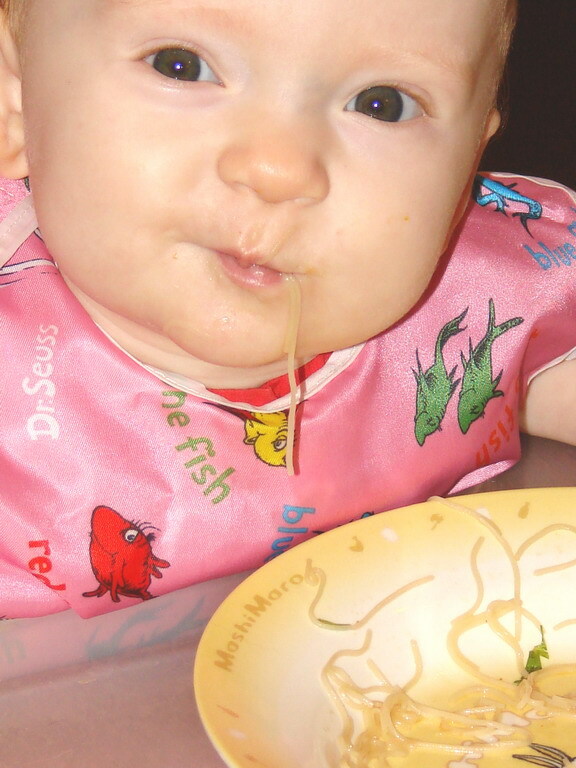 Noodles are the greatest! I ate some handmade noodles while in Vancouver recently and it was an experience I will cherish for a long time. It was amazing to watch the chef knead the dough and stretch out the noodles. Talk about fresh! I look forward to your series. This is great! The Asian aisle in my grocery store has a surprisingly good-looking selection of noodles, and I’d like to know what to do with them. It would be a nice change from the usual stir fry on rice (not that there’s anything wrong with that!). Your website is great, the tips and tricks are way cool and they do work. Thank you very much for all your help. I was wondering if you could help me with a couple of recipes that for many years ive been trying to replicate but have not been able to. 1. salt and pepper pork chop, why is the meat kind of red inside and is really tender? How do they coat the meat? 2. peking pork chop, its like sweet and sour pork only a bit darker red in color. It has a sweet and sour taste and another type of flavor that i can’t quite put my finger on, but its really good better than sweet and sour pork. And lastly is there a standard recipe for a wet batter or dry breading that is used in chinese cooking for either chicken or pork making it easy to deep fry and then tossed in a sweet and sour sauce, general tso, or orange sauce. I appreciate any help you can give me.